As I finished my post yesterday about my day hike with Betty Henderson at Fall River Lake, I noticed that, by the count on my spreadsheet, I was only 6.1 miles shy of 300 miles of day hikes in 2010. You know what that meant – I had to get in one more long day hike so I could top the 300 mile mark for the year! I’ve walked farther than that if I include many walks along portions of the Pathfinder Parkway, but I don’t count Pathfinder walks as day hikes. After all, the Pathfinder is paved and sneakers work as well as hiking boots on it. Speaking of boots, the pair I’ve used since I started tracking my day hikes in July 2009 are still working well. True, too many creek immersions and my own sweat have made them rather stinky. Spraying Lysol in them helped, but soon I’ll add some OdorEaters. To mark the end of the year I decided to finally solve one drawback of my boots – the laces have always been ludicrously long, with me laboriously tucking them under themselves every time I put on my boots. 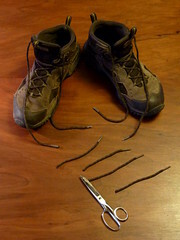 Enough of that nonsense and no need for new laces at this point – I took a pair of scissors and cut 6″ off each end of the laces for a full foot of lacing removed per boot. Homemade aglets of Scotch tape finished them off. I didn’t want to stray far from town – the weather would start in the low 50s but slowly drop throughout the day and I did not want to be out on the roads when New Year’s Eve arrived. So I returned to a favorite haunt: Osage Hills State Park. A year ago I started mapping all of the trails with an iPhone GPS app and I’m now familiar with all of the landmarks on the various hiking trails and the mountain bike trails. I knew that if I combined the Bugle Trail (a loop formed from the lake, cabin, and falls trails) with the Red Mountain Bike Trail I’d surely go over six miles and the magic 300 mile mark. I drove over to the park, along the way admiring the new water tank up on the mound above the airport and research center, which is being nicely fancied up to look much nicer than the old tank. In Osage Hills I parked at the stone building by the bike trails, which a Flickr user recently identified as an old CCC pump house. I set out on the Red Mountain Bike Trail with my new EveryTrail Pro app running to document the journey. I shot photos with my iPhone 4 of every landmark along the way and then, having gone just over three miles, set out on the Bugle Trail Loop as a separately recorded hike. Once again I shot photos of every familiar landmark, opting to skip the Creek Loop and Bluffs Trails this time since it was getting noticeably colder as I walked. I added a few short side trips along the way. 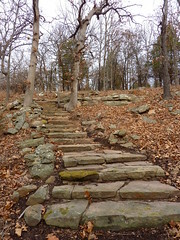 One new discovery was that the park employees appear to have cleared a grand rock stairway down from the cabin trail to the ball field. I broke out my regular camera for a shot of this welcome surprise. When I finally returned to my car I’d hiked another 4.3 miles, bringing my total for the day to 7.4 miles and my total for 2010 to 301.3 miles. Whoopee! I spent 47 days out on the trails in 2010, so I averaged 6.41 miles per hiking day. That’s up from an average of 6.02 miles per hiking day for the 25 days I hiked during the second half of 2009. I drove back to Bartlesville for a late lunch at Señor Salsa, where I added captions to the photos from the Mountain Bike trail. Then I tried to upload that hike over the 3G cell connection, but it ended with an error. I tried again at home over WiFi, but the errors continued. In the end I only got the track, in pieces, to upload to EveryTrail and only two of my photo placemarks were intact. How dreadful! Perhaps it was a mistake to use EveryTrail Pro? But I’m not one to let technological glitches thwart my ambitions. As Jerry Pournelle is wont to say, “I do these things so you don’t have to.” By golly, I wanted an interactive map of this hike with all of those photo placemarks and that was what I’d get…somehow. I’d set the app to save all of my photos to the camera roll and was able to download them from the phone to my desktop computer. Then I exported the track fragments from EveryTrail’s website into Google Earth and re-exported them as a single KML file, which I then uploaded as a new “trip” to EveryTrail. Then I uploaded all of the photos as well to that trip. Alas! Their geolocations were not recorded in them, unlike typical iPhone 4 photos. I then tried to sync the iPhone photos with the saved GPS track using GPicSync, but the darn photos also had no date/time data embedded in the JPEG images. Drat! I knew what I needed was the photo file’s date and time copied into the EXIF data embedded in the JPEG file. But I couldn’t find a utility to simply do that. Instead, I settled for using EXIF Date Changer to manually set the date and time stamp based on the precise time stamp for each file, which I could view with ThumbsPlus. Then I ran GPicSync again. That added geolocations to most of the photos, which I then renamed and uploaded once again to EveryTrail. Scanning through the results, I found that most of the photos were now in place, only having to manually relocate a couple of them. Voilà, my hike was restored! Lesson learned: Don’t try uploading EveryTrail hikes over a cell connection. Wait until you get a reliable WiFi connection and then have at it. And be sure to have the app save the photos you take to the camera roll in case the upload goes awry. 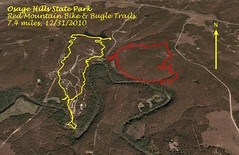 I’m willing to give EveryTrail Pro another try on my next day hike, which will be sometime in early 2011. A new year’s resolution: keep finding new trails to day hike in the region – they’re not exhausted yet. Happy trails, and Happy New Year! This entry was posted in day hike, photos, technology, travel. Bookmark the permalink.